Ah, ciabatta. Who doesn’t love that modest bread, with those gaping holes, that dusty crust shedding flour with each bite, that perfect pull and chewy texture, that creamy flavor? Nobody, that’s who. Though I have made ciabatta before, that recipe and the one below are different enough that I feel secure in repeating this particular item. 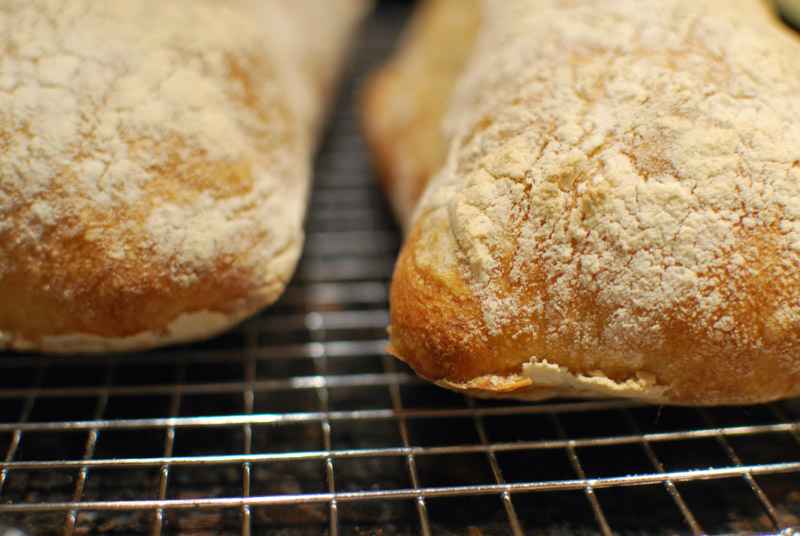 One similarity between the two – indeed, between all good recipes for ciabatta – is the use of a poolish, a.k.a. a very wet starter. The use of a starter here isn’t just for improved flavor (though it does provide that as well), but it also helps the dough form a stronger gluten network, so crucial for achieving those monster holes in the crumb. I’m at a bit of a loss to explain this recipe further. It’s not because it’s a mediocre or less-than-great recipe; in fact, it’s an excellent recipe, one that makes enviable bread, with relatively little effort. I feel like I should gush about it and the loaves it produces, but really, it’s just doing its job. Good ciabatta is fairly specific in nature (certain crust, certain crumb, certain texture, certain shape), and this recipe absolutely delivers. 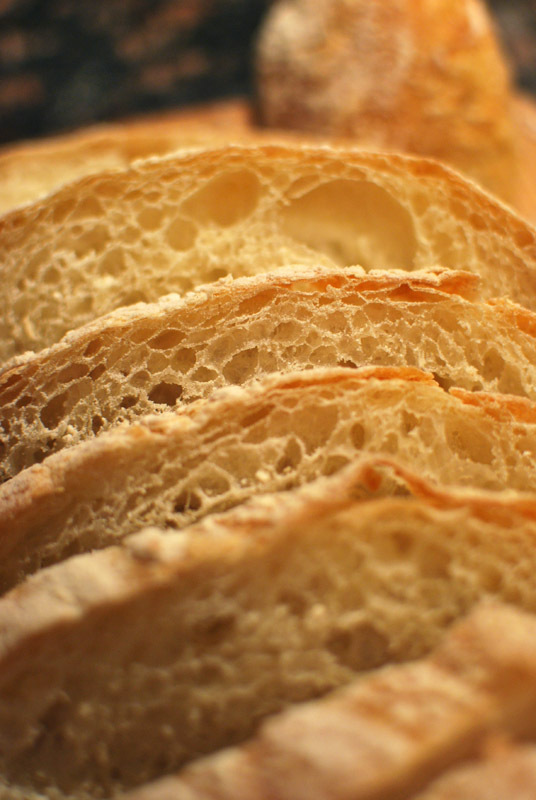 But ciabatta is also by nature very rustic, very unaffected, even a bit homely. To use further fancy prose here would be to give it fussy airs, when it’s really a simple thing. To me, this recipe requires little more description than this: it makes very good bread. 1. To make the poolish, whisk together the flour, water, and yeast until smooth. The consistency should resemble pancake batter. Cover with plastic wrap, and let sit at room temperature for 3 to 4 hours, or until bubbly and foamy. 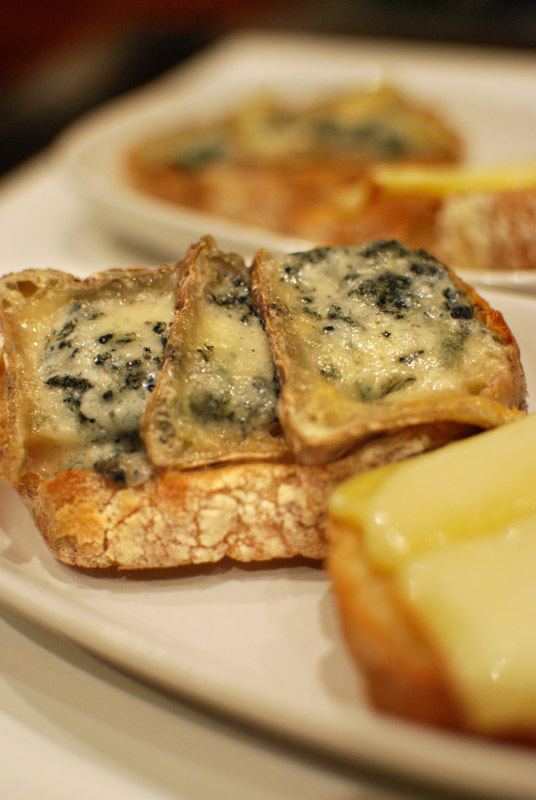 Refrigerate at least overnight and up to 3 days. 2. To make the final dough, remove the poolish from the refrigerator and let stand 1 hour at room temperature before proceeding. 3. In the bowl of a stand mixer, whisk together the flour, salt, and yeast. Add the poolish and 6 tablespoons of water. Using the paddle attachment, mix at low speed until a rough dough forms. If any dry pockets of flour remain, add the remaining water by tablespoons until all flour is moistened. 4. Switch to the dough hook, and increase the speed to medium. Knead for 5 to 7 minutes, or until smooth and supple. The dough should clear the sides of the bowl, but stick to the bottom, and be quite sticky and slack. Add additional flour or water as needed to correct the consistency. 5. Sprinkle a work surface liberally with flour. Turn the dough out onto the work surface, and dust the top with flour. With floured hands, lift the dough from opposite ends, stretching it to about twice its size. Fold the ends over the top of the dough so they meet in the middle, and the dough is roughly rectangular in shape. Dust the top again with flour, and cover loosely with lightly oiled plastic wrap. Let rest for 30 minutes. 6. Again, lift the opposite ends of the dough, stretching it to about twice the size, fold the ends over the top, and dust with flour. Cover loosely with oiled plastic wrap, and let rise on the counter for 1 1/2 to 2 hours, until puffy but not necessarily doubled in size. 7. Line a large baking sheet with parchment paper, and dust liberally with flour. Uncover the dough, and divide the dough with a bench scraper into 2 or 3 pieces, taking care not to deflate. Dust each piece well with flour, and transfer to the prepared baking sheet. Pull up the parchment between each piece, making a couche for the slack dough to rise in, using folded kitchen towels to prop up the outer edges of parchment around the outside pieces of dough. Cover loosely with lightly oiled plastic wrap, and let rise for 45 to 60 minutes, or until noticeably larger in size. Preheat the oven to 500º F, and place a rimmed pan in the oven to heat along with it. Heat a baking stone in the lower part of the oven, if you have one. 8. Uncover the dough, and slide the parchment flat again, removing the kitchen towels. Immediately transfer the loaves to the oven (sliding the parchment onto the hot baking stone, if using). Pour 1 cup of hot water into the preheated pan in the oven, and bake at 500º F for 2 minutes. Every 30 seconds, quickly open the door to mist the inside of the oven with water. 9. After 2 minutes, reduce the heat to 450º F, and bake for 15 to 20 minutes more, rotating the bread halfway through to ensure even browning, if necessary. The bread should register 205º F in the center when fully baked. Transfer the loaves to a wire rack to cool at least 45 minutes before slicing.